Central Asia is filled with sprawling metropolises, desert cities and mountain passes. It has a history that goes back even further than the time of Alexander the Great. Sixteen days on this stretch of the Silk Road will create memories that will last a lifetime. Visit a traditional yurt in Kazakhstan. Enjoy a boat ride on a lake In Kyrgyzstan. Take a guided tour through the streets of one of Central Asia’s oldest cities, in Tajikistan. Learn about the ancient art of paper making in Uzbekistan. As your flight lands at the Almaty Airport, you get your first glimpse of Kazakhstan and Central Asia. After you de-board the plane, your driver meets you and takes you straight to your hotel for the night. As you watch the scenery on the way to the Almaty city center, you get chills of excitement in anticipation of your sixteen-day excursion on the ancient Silk Road. You wake up refreshed and waste no time getting to know your surroundings. First on the day’s agenda is a sightseeing tour, where you see the Ascension Cathedral, the Kazakh State Circus, and the Almaty Central Mosque. In the distance, you can see the outline of the Trans-Ili Alatau Mountains, giving you a preview of what is to come on your journey. In the afternoon, you enjoy a welcome lunch of local cuisine in a traditional Kazakh yurt. After you say goodbye to the friendly faces and amazing sights of Almaty, it is time to board your private train. As you board, a porter helps with your luggage. Later, your tour guide welcomes you aboard and gives a casual talk about what to expect on the trip. After a refreshing welcome drink, you depart for the next country on your tour, Kyrgyzstan. As the morning sun find its way into your compartment, you see that you are arriving at the greater Lake Issyk-Kul area. You immediately realize that you are now in the midst of great natural beauty, a big difference from the sprawling metropolis of Almaty. Your first stop in this lush region is Cholpon-Ata, where you enjoy a boat ride on Lake Issyk-Kul, one of the largest lakes in the world. The breathtaking views of this enormous lake make you feel as if you’re at sea. Back on land, you go on a mountain excursion, which includes a picnic lunch and a Kyrgyz folk dance. After your full day by the lake, you are ready for the comfort of your private train. Once on board, you depart for Bishkek. A nightcap and good conversation prepare you for the next day’s adventure. On your second day in Kyrgyzstan you find yourself in Bishkek, Kyrgyzstan’s capital and largest city. Like Almaty, it is situated at the foot of a mountain range, the Tian Shan. You now begin to realize that Central Asia will never let you down. There is so much to see here, that you already have the feeling that you’ll be back again, and it’s only day four of your journey! Your guide takes you through the city, explaining everything clearly as you go. A visit to the Dordoy Bazaar, the city’s largest outdoor market, gives you a peek into the everyday life of Bishkek citizens. After the market, you visit the National Historical Museum then take a ride outside the city to the Ala Archa National Park. As the sun sets, you are ready to board your private train for Tashkent, Uzbekistan. As you wake from a comfortable sleep, your private train rolls into Tashkent, the capital of Uzbekistan, also known as the City of Stones. Although you’ve now experienced only two Central Asian countries, you feel as though you’re an expert. Your tour guide has been very informative from the beginning, and the staff on board has made you feel at home. Needless to say, you are ready for the day’s new sights. 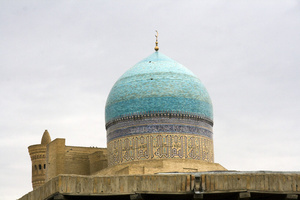 On your guided tour of Tashkent, you see the medieval Kukeldash Madrasa, the Amir Timur Museum and traditional Uzbek houses. After taking the day to discover the largest capital city in Central Asia, you are prepared to take the night for further discovery. An opera or concert in a music hall would do just fine as would a drink at the hotel bar. After breakfast, you spend the morning on board your private train, crossing the Kamchik Pass in the Qurama Mountains. By the afternoon, you reach Kokand, an important crossroads on the ancient Silk Road. You learn from your guide that it was once was the capital of an Uzbek kingdom - the Khanate of Kokand. You visit the Khan’s Palace, now a museum, which was the home of Khudayar Khan who had once reigned over the area. After taking in the city’s sights, you have the chance to visit a local family and help bake traditional bread. After an enjoyable day of exploration, you board your private train, which whisks you off to another adventure. On the way to Shahrisabz, you pass through a remote mountainous region of Uzbekistan, accessible only by your private train. Upon arrival, you immediately notice the eclectic character of the city. One of Central Asia’s most ancient cities, its architecture is a mix of Greek, Turkic and Mongol, which make it unique in the region. It is most notably the birthplace of Timur - a Mongol emperor from the 14th century. The city’s old center is a UNESCO World Heritage Site, home to one of many architectural highlights, including the White Palace, Timur’s so-called summer home. Later, you enjoy a folk dance that puts the region’s unique culture on full display. After a day of exploration, that evening you depart for Samarkand - another UNESCO World Heritage Site - on your private train. On board you are invited to a tasting of Uzbek wines. Today, you spend the day visiting the sights of Samarkand, which was considered the world’s most beautiful and prestigious city in Timur’s time. As your guide shows you the sights, you find it hard to keep your eyes on each one as he explains them. There are so many things to see that you wish you had two sets of eyes! 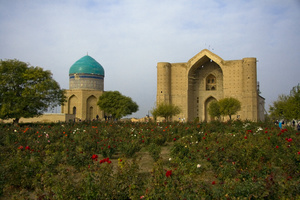 The city is filled with architectural monuments, including the Shah-i-Zinda necropolis, the Afrasiab archaeological site and museum, and Registan Square. The city is known for its Islamic influence, which is clearly shown through the beautiful mosaics, minarets and domes of its mosques and madrasas. By the time you get back to the hotel for dinner, you are glad that you have more than one day in this amazing city. Today is another day filled with amazing monuments to behold, including the Ulugh Beg Observatory, the Bibi-Khanym Mosque and the palatial Gur-e-Amir mausoleum. However, you also take a detour to get a glimpse into the Samarkand’s daily life. In a silk carpet workshop, you marvel at the ancient craft of silk weaving. A visit to an Uzbek paper-making family wows you with the process of making paper from mulberry bark. On your final day in Samarkand, you have morning to yourself. You take in some more of the amazing monuments of the city, but you also explore the Siyob Bazaar, the city’s largest market, and wander through the streets near the hotel, sampling the sights and smells of local galleries and cafés. Around noon and with a bittersweet goodbye, you board your private train and depart for Khujand, Tajikistan, for your next adventure. As you pull into the station at Khujand, your tour guide gives a brief overview of the city. It was formerly known as Leninabad and is now the second largest city in Tajikistan. As one of the most ancient cities on the Silk Road, it has been ruled by some of the world’s most successful emperors, such as Cyrus the great, who founded the city more than 2,000 years ago. With that in mind, you disembark your private train, expecting to see many amazing sights. One of your first impressions of the city is a unique view of the Syr River, whose beauty immediately fulfills your expectations. Among the highlights of your tour today are the Historical Museum of Sughd, which is housed in a restored bastion of the city wall, and the Panchshanbe Bazaar, possibly one of the largest markets in Central Asia, built in 1964. In addition to these impressive monuments to the city’s history, you also see many stunning mosques and have the opportunity to meet a local Tajik family. In the afternoon, your private train continues its journey westward. Today you arrive in Khiva, one of Central Asia’s hidden gems. When you first de-board your private train, the city seems somewhat plain compared to what you’ve seen so far on your journey. However, as your tour guide leads you into the city center, you begin to feel transported to another world. It is filled with mosques, minarets and mausoleums, and you get the feeling that you could spend all day among them. However, it is only when you come to the site of Uzbekistan’s first entry on the UNESCO World Heritage List - Itchan Kala - that you understand how amazing the city is. Itchan Kala is Khiva’s old town district, where city walls and bastions tower above you. Here you enjoy many fantastic ancient sights, including the brilliant turquoise mosaics of the Kalta Minor Minaret, and the Seid Alauddin Mausoleum, one of the oldest buildings in Khiva. It is in this fairy-tale setting that you enjoy lunch before getting back on your private train. When your private train arrives in Bukhara (your second stop in Uzbekistan), you smile when you remember that you’ll be here for two nights. That’s a good thing, because Bukhara is dense with architectural monuments and world renowned sites that originate millennia ago. Like Khiva, Bukhara has an old town that is a protected UNESCO World Heritage Site. Among the jaw-dropping wonders you visit here is Po-i-Kalyan, which contains the Kalyan Minaret, the Kaylan Mosque and the exquisite Mir-i Arab Madrasa. You also visit the equally beautiful Lyab-i Hauz, an architectural complex that surrounds a pond, once part of a system that provided water for the city. Later, you take your eyes off the dazzling architecture of Bukhara to watch a local dance performance, complete with colorful national costumes and music. After a good night’s sleep, you awake with one thing on your mind: exploration. Everything you saw yesterday whetted your appetite for more. Today, you adventure takes you slightly out of the center of the city. You visit the amazing Ark of Bukhara, which in addition to being an imposing ancient fortress was also a city within a city. You get your fill here of museums dedicated to its history, which spans more than a thousand years. Later, you take your exploration to the Samanid Park, a beautiful green space that surrounds the Samanid Mausoleum, a shrine to one of the last Persian rulers of Central Asia. The past two days were filled with so much wonder that you can’t help but think about the possibility of staying here longer. You walk the now familiar streets of Bukhara, imagining yourself as a local. Your revelry stops when you look at your watch and realize your private train will depart for Tashkent around noon, so you head back to the hotel. 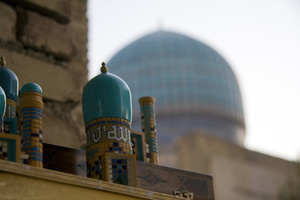 Later that afternoon you arrive in Tashkent, where you continue reminiscing and prepare your things.